The Hulk is back and he's been rampaging through New York. He's out on the hunt, looking for Bruce Banner, not fully understanding that Banner is inside the Hulk. One of the last to find this out is Matt Murdock, who at the moment is trying to unwind at some fancy looking party. Suits and dresses and no twerking. Not my scene, but to each his own. Matt's party gets cut short when his advanced senses start picking up an accelerated heartbeat. The heartbeat of a raging, rampant, massive Hulk! He makes a quick, stealthy escape and makes his way to the action. He gets there in time to catch the Hulk before he hurts anyone, but in order to do that he needed to bring the focus to him and only him. What's the best way to do that? Mention Banner of course. Now the Hulk has his eyes set solely on this puny blind man but Mr. Murdock being the smooth talker he is, was able to calm down the Hulk enough so that he turned back into Bruce Banner. Now that he's calm, he can listen to some reason, but not before a full night's rest. The next morning doesn't show any progress, Bruce is still having nightmares of the the Hulk tormenting him. He can't escape the jade beast. Matt console's his long time friend and sends him off with some clothes, money, and a promise that he'll always be there for his friend. Ain't that Matt a stand up guy? Then Bruce goes and does possibly the dumbest thing he could ever do, take the subway in New York City. Ah jeez, here we go. He gets pushed around a bit, shoved here, yelled at there, and of course, Hulk's out of the bag now. Luckily, Matt is still close by and felt that heartbeat again, just in time to get dressed and show up on the scene. The fight between the two is brutal to say the least. Hulk throws Daredevil around like he's weightless and throughout the entire thing, Daredevil is still trying to convince Hulk that violence isn't the answer. He's never going to find Banner is he keeps rampaging around and destroying things. Eventually, when Daredevil is too beat to keep going, the Hulk finally quits the fight. 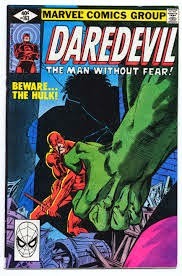 Staring into Daredevil's eyes, he realizes that this puny blind red man may just be right. He just jumps off and leaves the scene, leaving Daredevil broken and beaten. Meanwhile, Ben Urich is in the background gathering any and all detail he can on Daredevil, slowly putting together his expose of the Horn Head as Matt Murdock! Will the world know who Daredevil really is? How will this affect Matt and his business partner Foggy? What'll happen to all of Murdock's personal relationships?! Are we humans, or are we dancers?! Find out next week!